At that point, Murph called it quits and was replaced by Dave Shogren. Then, following his own dues-paying days, Pat Simmons joined the band as a guitarist-vocalist. After that, the first album was recorded . . . obtaining the aforementioned obscurity upon the day of its release. The period of time between Doobie Brothers and Toulouse Street was hard and remains a topic that brings a bad taste to the mouth of most of the members. The word was put out that the Doobies had been the house band for the Hell’s Angels, and the black leathered attire of the band on the cover of that debut album did little to refute the image. Producer Ted Templeman, also involved with Captain Beefheart and Van Morrison, is a strong influence on the group in the studio. 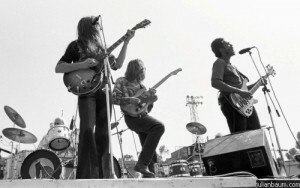 The inclusion of “Cottonmouth” was due to the suggestion of Templeman, who brought Seals and Crofts’ Down Home album into the studio and played the original cut for the band. The Doobies, who had never heard the song before, took a stab at it a few minutes later. Templeman recorded them and put the tune on the lp. “He does things on a tweke,” says Porter. “Listen to the Music” is the kind of break the most bands spent their entire career aspiring towards. 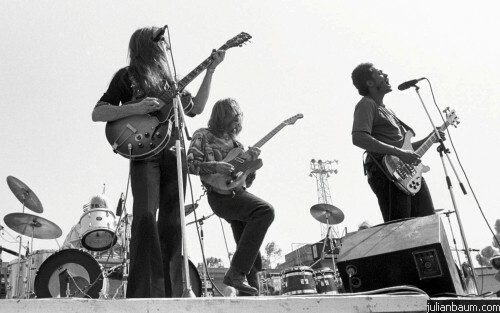 For the Doobie Brothers it was the difference between attention and oblivion. Translated into their own terms, it meant the difference between bars and concert halls. “As soon as we started playing concerts, we knew we were never meant for anything else,” Johnston beams. The nationwide tour with T. Rex gained a lot of favorable reaction from audience and press alike, and the Doobie Brothers appear to be finally and forever released from the depressing confines of rundown Berkeley scag-dens and dives. It could have happened to a nicer guy, though. Hartman, self-professed leader of the group and owner of the title “the white Buddy Miles,” is fascinated with his own menacing physique. He uses it to his advantage, too. Or let’s put it this way . . . he tries. The self-conscious reporter shuffles into Hartman’s hotel room, sits down and sets the microphone to his cassette recorder on the edge of an ash tray. With the tape whirling and microphone capturing the reporter’s awkward silence, Hartman snickers. “Ask me a question you’d ask Rod Stewart,” he taunts, loving every minute of it. Well, you know what they say. Nice guys don’t win ballgames . . . or gold records. Cameron you took me back stage to see the Doobie Brothers at the Sports Area! First year as a Flight Attendant…Had them on many flights…Great guys. Always gave us tickets to the show..✌?✈✈? ?